We updated our list of best snorkeling fins on the market for summer of 2019. How long should scuba fins be? Fins, also called flippers, present different features such as material composition, foot pocket and fin blade that will all vary depending on the type of underwater motion you want. For example: free divers will prefer to use fins that has thin fin blades and are highly flexible where they only need to spend a small amount of leg power to propel themselves to the deep. On the other hand, commercial and technical divers would prefer to use sturdy fins that has a ribbed fin blade where a single stroke would propel themselves forwards regardless if they are carrying heavy equipment or load. Another feature that also differentiates the type of fin being used in a particular environment is the fin length where the former prefers long fin size and the latter prefers shorter length. 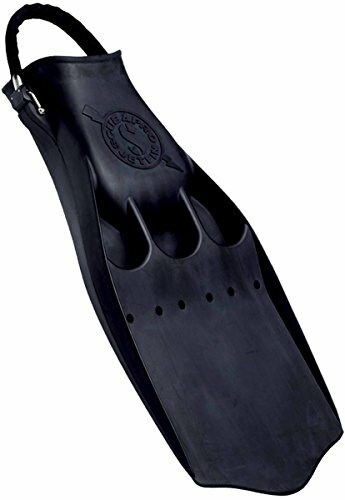 While classified as an open heel type of fins, the Scubapro Go Travel Fins also lets you experience the comforts of a full-foot fins courtesy from its soft and comfortable material. In fact, many of its users have only worn a pair of neoprene socks instead of a diving booties. This high performance fin that has an optimal length of 24 inch (60 centimeters) only uses minimal leg power allowing you to move smoothly in the water courtesy from its compact built and lightweight material that only weighs 3.5 pounds (1.6 kilograms). One of the features of the Scubapro Go Travel Fins customers love most is the self adjusting bungee heel strap which makes it very easy when donning or taking it off. This is on top of the fact that the fin straps are literally unbreakable. Another feature of this fin that may come in handy in case it falls off the boat during travel is that it is highly buoyant. Meaning, the Scubapro Go Travel Fins will float in the water and you will not be having a hard time chasing it during an accidental dislodge. As taught in our Open Water Certification, we should never walk with our fins on land. But what if we tell there is a fin that allows you to comfortably walk on land while wearing it without stumbling or losing your balance. 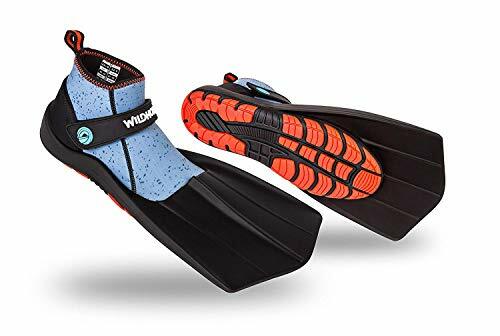 The Wildhorn Topside Snorkel Fins is architectural designed to have both fins and booties in just one footwear. The hi-cut booties is securely integrated with the fins with relatively short fin blades that is only 5 inches (13 centimeters) longer from the tip of the booties. This design enables you to wear the booties, walk on any pavement and all you need to do to enter the water is just make that big step without having any further preparations in putting up your fins as we typically do before entering the water. While the fin blades are short, many have expected that this is not an efficient fins as compared to what long fin blades do. Much to their surprise, many have appreciated its light and smooth handling while on water. The only downside that we see in the Wildhorn Topside Snorkel Fins is that a single fin kick only allows you to propel a few meters away and that you need to do more kick cycles to travel distances, regardless if you are snorkeling or scuba diving. If you have been renting your snorkeling or scuba equipment from a dive shop, then most probably you have seen this next featured fins. The Mares Avanti Superchannel Open Heel Dive Fins is a bestseller for dive shops, newbies and dive pros alike. This is due to the fact that its sturdy and heavy built (weighing 6 pounds or 2.7 kilograms) with a longer fin length at 26 inches (66 centimeters) will give its users more thrust and fin power while gliding longer along the water column. The fin power brought to you by the Mares Avanti Superchannel Open Heel Dive Fins is courtesy from its “Channel Thrust Technology” which uses a large central channel and 2 lateral channel design which gives its users optimal thrust. This technology was derived from observing manatees in the wild where they bend their tail forming a channel that creates maximum water displacement, which in turn, is converted to forward motion. While it all seems that the Mares Avanti Superchannel Open Heel Dive Fins is the perfect fins for everyone, we warn newbies, beginners or first-time users not to exert too much effort in using the fins. Otherwise, overexertion will set in which often leads to muscle cramps and need to perform the cramp removal skill. But as you go along with using this fins, you will soon realize that it will become a normal extension of your body and using it frequently will give you a smoother and lighter feel. Considered as the most durable fins in the market, the Scubapro Jet Fins has been used since 1965 by commercial divers and the military. It is also preferred by divers who wants a heavy sturdy material with a short fin blade where the potential thrust of the fins matches the strong leg power of seasoned divers. But being an icon, as far as fins are concerned, has something to do with its design. The Scubapro Jet fins has one of the shortest fin length at 18 inches (45 centimeters). While design can be limited in its restricted space, this fins features several characteristics that significantly adds to its fin prowess. Just after the shoe pocket, it has 3 vents and 6 small holes. This feature has been proven to decrease water drag during an upstroke and increases power and thrust during a downstroke making it great if you are doing the frog kick. With this, it has become the preferred fins for cave diving, wreck diving or any dive profile which requires penetration to a restricted space. Just a word of caution, the fins is quite heavy and sinks to the bottom in case of an accidental fall-off. With this, you may be required to decrease your lead weights during diving. On a final note, there is no such thing as the perfect fins. It all boils down to the type of diving environment you are exposed to and your experience. Simply put it this way: there is no point of using a long and heavy fins if it is your first dive. Comfort and fit is still paramount. Speedo Short blade fins are the perfect set to start off at a reasonable price. The short fins allow for maneuverability without loosing power! Easy to travel and store with. Phantom aquatics short finned closed heel is great for not only snorkeling but great for the pool as well. Comfortable yet strong enough to last travel and the rough sea. SEAC ultra long fins are not only great for great long distance snorkeling but also even better for diving under sea level. You will be able to catch a closer look at everything with the speed you will noticeably see with the extra long fin. Comes with a bag. Oceanic Vortex closed heel split fins offer a more gentle kick for those with hip, knee, or back issues. The split fin won't sacrifice power for effort. A great mid to upper level fin that will keep you strong in the water. Atomic Aquatics open heeled, long split fins are for that next level of snorkeler. Quick release heel straps and easy pull tab make it a breeze getting the fins on. The split fins make it effortless in the water. Highly recommended if you are in the water lots. ScubaPro open heeled, split fins are the next step up. More heavy duty and great for not only snorkeling but diving as well. Work great with a boot. Split fins flex independently to produce more propulsion when you are in the water. Finis Edge has a combination of blade angle and hydrodynamic vents for a natural kick cycle with instant forward propulsion. The wide design allows you to go faster without extra work. A unique change in the water to catch those fishes. US Divers open heel dual composite fin is one of the most comfortable fins I have used and is very travel friendly. Lots of different colors to choose from and some come with a carrying case. With the open heel you have the option for boots or snorkel socks but not necessary. A great purchase! 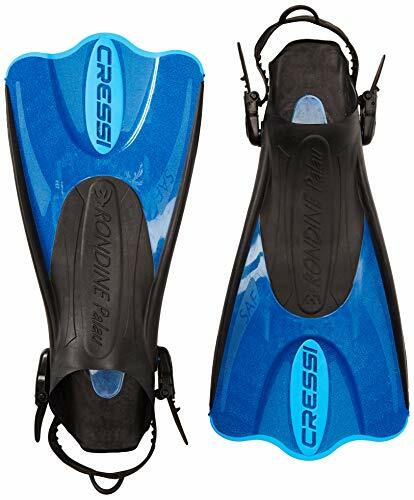 Cressi closed heel long fins are great fins whether you are just starting or seasoned pro! The longer fins will give you more power through the water with less energy. A great fin and you can never go wrong with Cressi. As far as recreational scuba diving is concerned, the recommended fin length should be 2 feet (24 inches or 60 centimeters). Using this ideal fin length will give you optimum leg power to propulsion conversion. Meaning, it is not too short that you need to make more fin movements to attain a cruising underwater speed or too long that you need to exert more leg power. However, this is just a recommended figure where most fin lengths made by manufacturers will deviate on a plus or minus 2 inches (5 centimeter) factor to cater the different sizes of the fin pocket. Each fin will be specifically designed for the type of snorkeling you will be doing. Determining your fin will rely on 2 factors: your shoe size (American Size/inches) and your fin size. Also kids sizes are available. When trying a fin on you want it to fit comfortably and correctly. They should be snug because with movement throughout the water they will loosen up slightly and when they dry they will shrink a small amount so taking that into account. You need make sure that there are no hard spots that give you discomfort while trying them on. We found this handy chart on a ﻿dive forum. 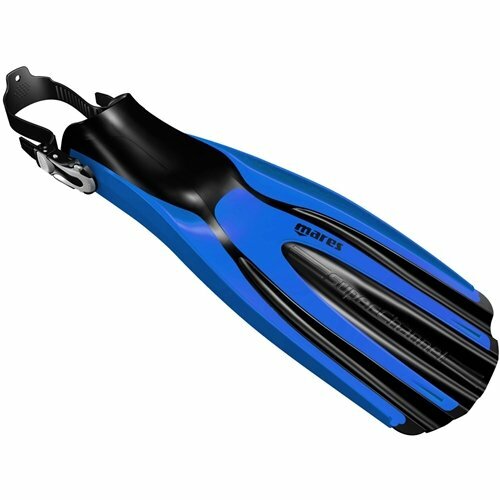 We will get into this shortly, but if you are purchasing open foot snorkeling fins make sure you buy the booties first and try the fins on with them. Just like with anything you want to be comfortable while you are snorkeling or this will take the fun out of the activity. This is one of the debates we will have in which is the better option. To talk about specifics with them, the main difference is one fin is longer than the other. The reason for this is the short fins is primarily it makes travel easier but also for the people who associate themselves as beginners it makes it easier to kick in the water even though you are not moving as fast. If you are swimming in a close area it makes it less chance you will run or kick into the reef or surrounding areas. For the longer fins because they have a longer leaver length it may feel as though you are using more energy and you are but you are getting more power and making your movements more efficient in the water. If you are planning on snorkeling more than just once or twice on a recreational sightseeing tour and will be in the water for longer periods of time, the long fins will benefit you overall. As for space in your suitcase, most likely you will be in a tropical environment and won't need much luggage anyways but if you are packing heavy we will talk more about snorkel fins for travel later on in this article and can find the best option for you. Having snorkel fins with boots or neoprene socks bring into another conversation of open heeled vs. closed heel. When a person has a open heel it refers to someone having to wear a boot with their fin. The reason for this is if you are walking across a rocky, sandy, or dangerous area to get into the water, one wants to protect their feet getting into the water. Most scuba divers have open heeled boots as well because it provides them more insulation when they go to deeper depths and it becomes colder. Also having a boot that is comfortable there is a smaller chance of getting a blister on the back of your heel from the closed heel fins. That being said there is a large variety of closed heeled fins that are very comfortable and don't cause blisters but one needs to be careful in choosing which fin is best suited for their foot. Along with the closed heeled fin they are cheaper and it doesn't come with the extra cost of buying boots as well. It saves on space in your luggage meaning it is cheaper on the airplane so you don't get hit with an extra charge. Another perk of closed heeled fins is they are more efficient in the water which is due to being less bulky in the water. If you are worried about space for travel or getting into the water safely, wear flip flops or water shoes down to the water. If you fins do give you blisters you can always wear socks with them and it works well if your fins are slightly big to. With lots of conversation around the two different fins: paddle fins have been are for years and work great. Again, with those of you are consider yourselves beginners paddle fins offer you a quick start without little thought. You are able to do a variety of kicks giving you more mobility when you are in close areas with coral. Having long, strong, kicking strokes this allows you to relax in the water and enjoy your snorkeling experience. Split fins as you can see are shaped quite differently. There is a long slit down the end of the fin towards your foot which allows water to pass through the fin during each kick rotation. This creates an easier glide throughout the movement. The oceanic split fins are one of the most popular and come in both open heeled and closed heeled in a variety of colors and sizes. As the split fins are easier to kick with this may provide more comfortable with people having joint pain throughout the back, hips, knees, ankles or any other lower extremity throughout the body. If you are new or have any injuries the split fins may be a better choice for you in terms of comfort and easier on the body. As there is no scientific studies to actually prove wrong or right, just like anything it goes on to personal opinion so if you are not a believer of one or the other, try them both and you decide. There are lots of external factors that happen in the ocean or body of water you are in that you cannot predict and each fin will manage slightly better in different situations and it is up to you to make that call. The Cressi Palau short snorkeling swim fins with mesh bags are perfect for the first time snorkeler or advance veteran. The 16.5 inch tip to heel allows for lots of room when you travel and won't lose out to power when you are in the water. The open heel design allows for you to wear your favorite snorkeling socks or water boots to prevent any blistering of the heels, however the soft rubber and pliability allows for some people to not need anything else other than the Cressi fins. The adjustable straps make it easy to tighten and loosen whether you are in or out of the water with no slipping. You can maneuver in shallow areas with lots of coral around and not disrupt the natural surrounding because the fin is shorter. It accommodates 3-4 consecutive sizes from XS/S to LG/XL. With a black tone the Cressi Fin finishes off with many color options that will set you apart from the rest and be easily visible in the fantastic coral you will be snorkeling in. The Cressi light, swim fins for men, women and kids are a short closed heeled fin in which you do not need a snorkeling sock unless you prefer one. The light weight short fin allows for agility and efficiency. They come in black with a blue or white finish. The light weight Cressi fins allows for great travel fins or the avid swimmer in the pool. Different reviews are glowing with these fins from triathletes to people improving their swim technique. The durability of these fins allow for hours and hours of use without wear and tear. If you are an avid traveler you can scrunch them up, throw them in your bag and pull them out good as new as they won't lose their elasticity. With your toes peaking through the front of the fin, it ensures more comfort and freedom for your toes as you swim as to not confine them. It is recommended that you buy one size smaller to fit your foot accordingly and perfect for the whole family as they come in men's, woman's, and child sizes. This economical fin won't break the bank and fits all your needs for travel, leisure, and the professional that wants to improve their leg strength by using those bum muscles. The Atomic aquatics high performance full foot split fin is the latest and greatest from Atomic. The closed heel fin always you to go bare foot or with a thin snorkel sock/booty for your comfort. The long split fin allows for a smooth strong glide in the water and with the closed heel they are even lighter than the opened heeled so you don't have to fool around with straps. They have an open toe design that allows for your foot to breathe in the water unlike closed toe designs they allow for more wiggle room if you are sharing your snorkel fins with someone close to the same size. The longer fins make for a smooth kick that will propel you with power in the calmest of environments or in a strong current. The split fin makes it easier on joints and muscles because there is less resistance to push against through the water but without sacrificing speed or momentum. Good for mild injuries through the lower legs or back because it does not put as much pressure through the body. The sleek black or yellow color will get you where you need to be available in sizes 4.5- 14. They fit as is but remember that if you are wearing a sock to account for the extra layer. The Atomic Aquatic split fins take it to the next level for snorkeling fins. The power to weight ratio for kicking is phenomenal. The split fin allows for a smooth strong kick without losing power and the easy release buckles make it a simple on and off process. From a crowded boat or getting in to see that beautiful parrot fish swim by before it goes makes these fins a personal favorite. The high energy polymer fin material creates less drag and friction but still having the durability to not wear out after a season or two in the water. The open heeled design and quick release make this easy to wear booties or snorkel socks for your comfort and can be even worn with bare feet and not give blisters for most. If you get leg cramps, sore legs or have lower extremity pain these are the fins for you. The long length and split fin creates power by using less energy and saving muscle fatigue. They are a bit more than your regular slip on off fins but you get what you pay for with these fins whether you are just starting out or a seasoned veteran these fins will pay off. They come in a variety of colors including smoke, pink. blue and many more. Available in sizes small, medium, large and extra large. The Oceanic Vortex V-16 Split Dive fin has an extra long fin for full propulsion while you are snorkeling and the patented Nature's Wing® propeller fin technology proves that. The snorkel fin is made out of 4 materials that allow the semi rigid battens and natural rubber flex channels glide through the water with ease. The open heel design and quick release buckle makes it easy to get in and out of the fins with or without boots or socks. It has a loop on the heel for when you are putting your fins on you can put a finger or two in and pull back without grabbing and pinching your fingers in between your foot and the strap. The quick release straps make it easy to get the fins off when you are getting in and out of the boat. If you end up in a shallow confined area with coral it makes taking the fins off easy and not destroying the natural coral surrounding area by hitting your fins with it. You can easily jump in the water with fins in hand and put them in without aggravation. They are meant to be worn with boots or socks so they are meant to fit slightly bigger and come in a variety of sizes and colors that will not dissapoint. Snorkel fins, much like any other piece of snorkel equipment are very specific to each individual needs. One needs to think about small versus wide feet. Large versus tiny feet. long versus short fin (which I will explain later on). Fins while wearing boots and different kinds. Also if you will be even able to travel with them so they are not over sized. There are just as many kinds of fins as snorkel masks and hopefully this section will clarify some of your needs.